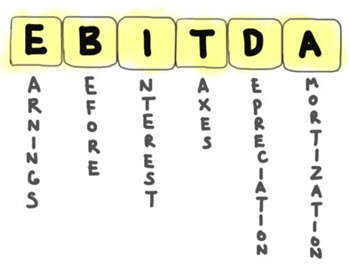 EBITDA (earnings before interest, taxes, depreciation and amortisation) can be used to calculate the financial strength of a company in order to directly compare it with another. It is one of many useful metrics employed when attempting to make investment decisions. The calculation measures the company’s profitability before deductions. It will essentially show you the net income of a company, with certain expenses added back into the total. When a big company has either significant investment in fixed assets or large amounts of debt, it can be helpful to know the company’s true operating cash flow – then non-operating expenses, such as depreciation and interest, can be removed from the mix. The EBITDA calculation is made by subtracting all expenses, apart from interest, taxes, depreciation and amortisation from the net income. The calculation is most often made in reverse – that is, you would start with the net income and then add to this the interest, taxes, depreciation and amortisation. Earnings – while the term ‘earnings’ is used, it more accurately refers to the net income or net profit. This figure is usually found at the bottom of a company’s income statement and is the bottom line profit. Interest – the interest expenses will vary greatly from one company to the next, and also across different industries. You can find this figure on the non-operating expenses section of the company’s income statement. Taxes – taxes change on a yearly basis and may be different between business types. This is sometimes because of the size of the company, sometimes due to the industry in which it operates and sometime dependent on its location. Just as with interest, the figure can be found on the non-operating expenses section of the company’s income statement. Depreciation and amortisation – This allocation shows the cost of capital assets during the relevant period. Once again, the figure can be found on the non-operating expenses section of the company’s income statement. You may want to use the earnings before interest, taxes, depreciation and amortisation when you are considering the profitability of a company. Unlike a financial ratio, the EBITDA is expressed in a pound or dollar figure – as opposed to a percentage. The higher this number is the more profitable a company is, and if you are looking to invest in a company then obviously you are looking for a high number. There are, however, disadvantages, and some investors do not like to use this metric. One problematic aspect of EBTIDA is that it effectively looks at a company as though it never has to pay interest or taxes. It also doesn’t account for the devaluation of assets such as company computers or machinery. Another disadvantage of using the earnings before interest, taxes, depreciation and amortisation metric is that you cannot compare companies of different sizes; for this, a ratio and a percentage is far more useful.